4 STUDENTS RECEIEVD SPECIAL MENTION AWARDS...WOWWWW CONGRAULATIONS TO AIMAN HAFIZUL AKRAM (BINTURAN PRIMARY SCHOOL), ABDUL MALEK (SM SMJA), sITI nURSAKINAH AND AMIRUL AKMAL . THE FOUR BRONZE MEDALIST RECIPENT AT IJSO, GYONGNAM, REPUBLIC OF KOREA. This year as the third participation of Brunei Darussalam to the International Junior Science Olympiad (IJSO), records the best result so far with four (04) students achieved Bronze medals. This is the highest number of medals received by our students at IJSO. The competition was participated by 247 students from 51 countries. Maktab Sains Paduka Seri Begawan Sultan.  ‘Science Talk’ by well esteemed scientist.  Visits to places of interest which include : Junan Reservoir & Upo Wetland; Naval Academy; Gyeongnam Arboretum; Jinju Castle; Gyeongnam Race Park; Gimhae & Busan. The International Junior Science Olympiad [ IJSO ] is an annual individual and team competition in the natural sciences for fifteen-year-old students. It has been established in recognition of the significance of the natural sciences in the general education of young people and in all aspects of their lives. It is a purely educational event. It is a place where those scientifically talented secondary students gather to gain more confidence and develop their dreams to be a future leading scientists by experiencing greater world while competing each other. • To stimulate the active interest of students in the natural sciences. • To promote their career as scientists. • To enhance and develop international contacts in the natural sciences. • To promote future scientific collaboration. • To encourage the formation of friendships within the scientific community. • To offer the opportunity to compare the syllabi and educational trends in science education within the participating countries. Sila e-mail kepada khan8933@hotmail.com jika memerlukan gambar-gambar yang terdapat didalam blog ini. 10 TH INTERNATIONAL ROBOT OLYMPIAD, DECEMBER 17-21, Kuala Lumpur. Rombongan berangkat pada 16 December 2008, Jam 11.45 pagi. Eight students and a teacher left for Singapore yesterday for the Sunburst Youth Camp (SYC) 2008, which began yesterday and runs until December 13. One of the objectives of the SYC is to provide opportunities for Asian youth to come together for a week of sharing, understanding and bonding. The students will experience rustic Singapore at the Outward Bound School (OBS) in Pulau Ubin, the thrill of rock-climbing and thrust-fall, the Sunburst Challenge and other activities on team-building. They will also learn about educational opportunities and scholarships available at Singapore universities, get a hands-on experience at the Singapore Science Centre and the Night Safari. They will also visit the parks and City Gallery, and test their culinary skills at the "mix-and-match" picnic. Twenty secondary school students from Singapore will arrive this Sunday to join a similar number of students from Brunei Darussalam for a six-day friendship camp to forge friendship ties between students of the two nations. Entitled Brunei-Singapore Adventure Camp 2008, the activity in Brunei is a continuation of a similar friendship camp, which took place in Singapore (known as Singapore -Brunei Adventure Camp 2007) from November 11-17 last year. The 20 participating Brunei students from last year's camping activity in Singapore will participate as trainers and guides for this year's camp. Students from the two nations will interact and take part in team-building adventure activities and games to promote international understanding, collaboration and bonding. The student camp aims to forge new friendships across national borders through various team-building games and outdoor activities. The camp also serves to educate students on the need to conserve the natural environment to preserve its biodiversity and the need to preserve the cultural heritage of one's country through nature activities. These are done through expeditions to Kg Ayer, historical centers in Bandar Seri Begawan, Tasek Merimbun Reserve Forest and Bukit Shahbandar, planting paddy at Wasan, witnessing sago processing in Tutong, eating ambuyat, participating in challenging activities at Temburong National Park, visiting Kg Amo, Longhouse, Temburong, watching the manufacturing of traditional food of wajid and cendol in Temburong. Student exchange through the adventure camps is a key area of cooperation in the Memorandums of Understanding on Educational Cooperation that were concluded between Singapore's Education Ministry and Brunei Education Ministry in February 2006. The official opening ceremony of the Brunei-Singapore Adventure Camp 2008 adventure camp will take place at Wasan Vocational School on Sunday afternoon while its closing ceremony on Friday night. Brunei participants meanwhile have recorded a theme song for the camping activity Together (Here We Meet Again). during the opening ceremony the chief guest was Datin Paduka Afsah Bte Hj Abd Majid, Permanent secretary (CE) Ministry of Education. The camp staretd from 30 November Until 6 december 2008. Majlis diadakan di Hua Ho MAll, Manggis pada 1 December 2008. Tetamu kehormat majlis Yang Mulia Pengiran Dato Seri Setia Dr.Haji Mohammad Bin pengiran Haji Abdul Rahman, Pemangku Menteri Pendidikan. Turut didakan di majlis sambutan 15 tahun ini ialah pelancaran Buku Pelan Strategik 10 Tahun Jabatan Pendidikan Teknik. 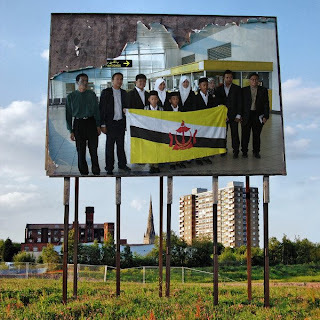 KUNJUNGAN MUHIBBAH PEGAWAI BADAN AKREDITASI NASIONAL (BAN-S/M) REPUBLIK INDONESIA KE NEGARA BRUNEI DARUSSALAM MEMBUAT LAWATAN KE KEMNTERIAN PENDIDIKAN BRUNEI PADA 11 DISEMBER 2008. TUJUAN KUNJUNGAN BAGI BERKONGSI SAMA DENGAN BADAN KEBANGSAAN PENGIKTIRAFAN KELULUSAN NEGARA BRUNEI DARUSSALAM. Majlis PEnyerahan Bantuan BISTARI kepada murid-murid Sekolah-Skeolah Rendah Daerah Tutong uyang kurang berkemempuan. The Brunei Government Senior Officers Wives Welfare (Bistari Association) presented donations amounting to $20,000 in its effort to provide less fortunate students in the country with financial assistance. This year, the donations were for less fortunate students in the Tutong District. The presentation ceremony took place yesterday at the Ministry of Education's Department of Schools in Jalan Ong Sum Ping, and the contributions were presented to the headmasters and headmistresses of 17 schools in Tutong. The event started with a mass recitation of the Surah al-Fatihah led by one of the Education Officers. Sekolah Rendah Masin, Brunei IV meraikan Sambutan Jubli Emas nya pada 29 November 2008. sekolah ini ditubuhkan pada tahun 18Julai 1957, dan sebetulnya sambutan dirancang diadakan pada tahun 2007, tetapi atas beberapa sebab tertentu ia ditunda ke tahun 2008. Tetamu kehormat majlis smabutan Pemangku Menteri Pendidikan,Pengiran Dato Seri Setia Dr.Haji Mohammad Bin Pengiran Haji Abd Rahman. PEMANGKU PENOLONG PENGARAH (BHG PENDIDIKAN RENDAH) JBT SEKOLAH-SEKOLAH KEMENTERIAN PENDIDIKAN.